Master the power of influence and persuasion to achieve more in work and life. For business leaders and managers, as well as those who work in sales, the power of influence can be a potent advantage. The ability to persuade others based on what you know about them is the first step to convincing someone to buy your product or buy into your business vision. 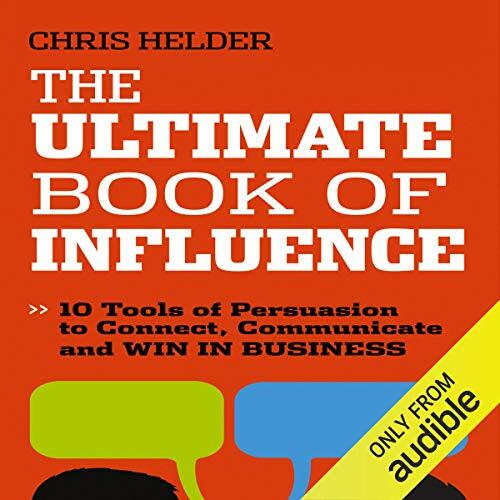 In The Ultimate Book of Influence, author Chris Helder - a master of communication and one of Australia’s most sought after speakers on influence - shares 10 essential tools that will enable you to influence others so you win the sale or seal the deal. The tools in this book will show you how to read body language, uncover what’s most important to a client, convince others to take action, understand the four essential types of people at your workplace, and much more. Written by one of Australia’s most successful speakers on the art of influence Includes ten powerful tools that allow you to understand what matters most to a client or colleague and use that knowledge to influence their actions and behaviors. This book is ideal for salespeople, business leaders, corporate executives and anyone who must regularly convince others to take action. Before you can truly influence people, you need to learn how to communicate effectively. The Ultimate Book of Influence teaches you how to choose the right kind of communication technique for any situation, so when you speak, you know people are listening. About the author: Chris Helder is a certified practitioner of Neuro-Linguistic Programming specialising in advanced communications and behavioural modelling. His global client list includes high-profile companies from the financial, technological, pharmaceutical, manufacturing, and automotive industries. He regularly presents his high-impact presentations and workshops throughout the Asia-Pacific region, the US and Europe.